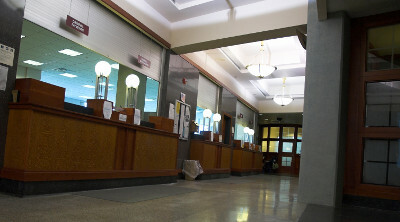 One of my favorite stories about the difficulties of dealing with court clerks was told to me by a co-worker, who had spent many years as a bailiff in a court known for having a particularly rude clerk staff. I'm not referring to the judge, mind you. On the contrary, she was known for being fair and generally pleasant. The staff in her clerk's office, on the other hand, was known county-wide for being unprofessional and rude (and sometimes just downright vile) to attorneys, support staff and anyone else who had the misfortune of darkening their doorway. One day, my co-worker came upon a local attorney standing outside the door of said clerk's office, looking troubled. True to her always helpful character, she asked the attorney if he was okay to which he replied that he had documents to file, but was afraid to go in because the staff members in the clerk's office were always so mean. Now, this was a well-seasoned attorney with practices in two states who had a reputation for being a formidable opponent in the courtroom, and here he was, having to work up the courage to complete a routine document filing due to the consistently awful behavior of the staff in this particular office. My co-worker, having long-since developed a thick skin to the antics of the offending staff members, offered to file the documents on the attorney's behalf, and he gratefully accepted. My own experience with how to deal with court clerks began in law school, when a professor cautioned our class to always treat the clerk and his or her staff well because they have the ability to make or break you as an attorney. Over the last 15 years of dealing with hundreds of court clerks all across the country, both as an attorney and as a developer of do-it-yourself legal products, I can tell you they run the gamut--from professional and helpful to just plain nasty. I've also come to understand that there's a right way and a wrong way to deal with them, and knowing the right way can make the difference between a smooth and inexpensive pro se divorce and having to hire an attorney to represent you. There are a couple of things you need to understand about court clerks as well as their staff members (who we'll collectively refer to as just "court clerks," even though you usually won't ever interact with the court clerk directly). First, court clerks aren't attorneys and they can't give you legal advice. Moreover, how they define "legal advice" is sometimes much broader than it should be and as such, often they won't give basic procedural information that they probably should be giving. On the other hand, I've also encountered plenty of court clerks who, in an genuine effort to be helpful, have asked too many questions and volunteered far too much legal advice that was often inapplicable to my situation and would surely have confused the average pro se filer. First, the primary tasks of the court clerk in a new divorce case are to collect the filing fee and take your paperwork on behalf of the judge. Whether your paperwork is legally sufficient is a determination that should be made by the judge (or possibly by the judge's law clerk who usually is an attorney supervised by the judge), but not by the court clerk. However, as a practical matter, many court clerks see themselves as the first reviewer of your documents and as the assessor of your ability to handle representing yourself without an attorney. Second, court clerks generally want their offices to run as smoothly and efficiently as possible. That's a no brainer. So, if they see someone walk in fumbling with a stack of papers or wearing a face that says "I'm not sure I can do this," they tend to feel annoyance rather than pity. It makes them not want to deal with you, either now or down the road when you have other paperwork to file, so they instinctively begin to thumb through the mental scripts in their heads of what they need to say to diminish your confidence and cause you to turn around and head back out the door without filing your divorce paperwork. 1. "You can't file for divorce without an attorney (1) if you have minor children together or (2) if you use online paperwork." DivorceWriter: "I'm getting ready to file for divorce without an attorney. My spouse and I agree on everything. Is your office going to refuse to accept my paperwork just because (insert your reason: my spouse and I have minor children together, my paperwork was prepared online, etc.) or will I at least be allowed to file my documents and get them in front of the judge?" Court Clerk: (After a long pause) "We'll accept anything you want to file, but if the judge rejects it, you'll lose your filing fee." This takes us to confidence killer #2. 2. "You'll lose your filing fee if your paperwork is wrong." To be sure, if you file divorce paperwork and the judge decides it's not legally sufficient, especially if there's a problem with the initial pleadings like the divorce petition, and you do nothing about it, the judge can dismiss your case and you may well have to pay another filing fee when you file for divorce again down the road, either with an attorney or on your own. However, generally speaking, the judge's office will notify you if there are deficiencies in your divorce paperwork and give you a certain amount of time to file amended documents. This isn't always easy since not all rejection notices tell you exactly what's wrong, which means you'll either need to figure it quickly or hire an attorney to figure it out for you. Still, understand that it isn't like the judge looks at your paperwork, decides it's junk and tosses your file in the trash. You paid a filing fee and have been assigned a case number, and there's a protocol in every court for how cases are handled when incorrect or insufficient documents are filed. 3. "If you represent yourself, you need to know everything an attorney knows." I think a more helpful and less intimidating way for them to say this would be "don't expect any favors just because you don't have an attorney." In other words, anyone who represents someone in a court of law is expected to have a basic understanding of the process and the rules, and this includes someone representing him or herself. However, to say that a pro se filer has to know "everything that an attorney knows" is just plain silly. For one thing, an attorney is only going to utilize a certain portion of his or her legal knowledge when handling a divorce case. Uncontested divorce cases where spouses have agreed on all matters, which are the best candidates for do-it-yourself divorce, are mostly a matter of filing the right paperwork at the right time. That all being said, for the most part, while court clerks would prefer that people have attorneys to represent them, they have long since accepted that people, especially in family law matters like divorce, will choose represent themselves in court for any number of reasons. Moreover, the vast majority of DivorceWriter customers are able to file for divorce without incident. Still, understanding the basic functions and goals of your court clerk's office and knowing what to say and do should you encounter any difficulties are key to your success in divorcing without an attorney. For more information on having the best experience possible with your court clerk's office, read Top 5 Tips for Interacting with Court Clerks. Your Day in Divorce Court - What to expect if a court hearing is required. Divorce Filing Fees - How much are the filing fees in your state?